James willingly becomes the face of the Children of Liberty and Lena moves forward with her experiments that could grant Humans super powers in another racially charged episode of Supergirl. The choice in story this season means that the writers have to walk a thin line in terms of how they’re portraying it. So far they’ve done a really good job establishing Ben Lockwood as intelligent, calculating and relentlessly driven. His ideal are backwards in that he wants Humans and aliens to be divided but his views also make sense for him as a character as it can be seen how he arrived at them. The tricky part is translating this into something that the main characters can be involved in. Ben has chosen James as the poster boy for Humanity because he sees Guardian as a hero of the people that can be used to promote his cause. James has resolved to try to exploit that in order to infiltrate the organisation, learn what they’re planning and find a way to bring them down. At least, that’s what I think he’s trying to do though the show isn’t actually clear on what he’s hoping to achieve here. This episode brings him face to mask with Agent Liberty and what plays out when this happens is just bizarre. James treats it like an interview and asks him what happened in his life to turn him into a crusader against aliens. Ben gives the stock answer that doesn’t really mean anything because the language is so dispassionate and clinical. It does fit the detached nature of wearing the mask which makes it impossible for any emotional connection to be created because he has his face covered and the mouth is unable to move but the rhetoric is uninteresting because it comes across as a mission statement rather than a well founded belief system. 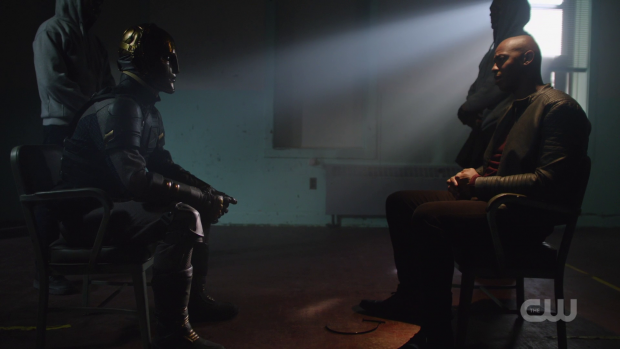 We know that Ben has strongly passionate opinions as they are heard elsewhere in this very episode but the conversation between James and Ben in his masked identity is a wasted opportunity. 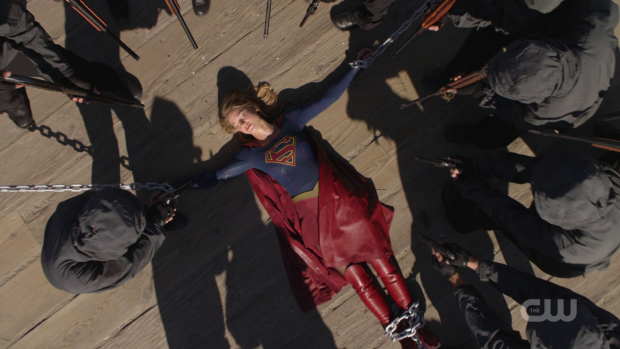 The main purpose of this scene is to set up that James is to be used as a symbol of the cause by being the one to blow up Shelley Island; the Supergirl equivalent of Ellis island where aliens are processed for immigration. It’s a symbol of equality and inclusion so James aka Guardian being the one to destroy it would in theory send a powerful message to the people that James champions that cause and considers aliens unwelcome on Earth. This doesn’t work as there’s a big difference between heralding James as a symbol of their cause and setting him up as the responsible party for the destruction of a monument. 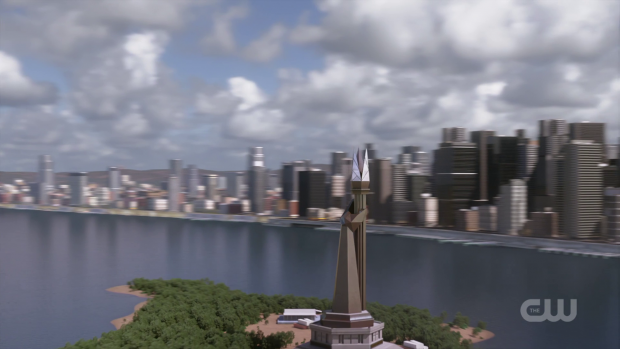 It should be well known that Guardian isn’t the sort of hero/vigilante that would blow up a building so it’s unclear what Ben is trying to achieve that he couldn’t through the monument’s destruction without a specific individual to blame. Another issue is Tom’s apparent change of heart. It makes sense that James would go along with this plan in order to stop the Children of Liberty from killing Tom. The destruction of an empty monument is a price he’s willing to pay if it keeps someone alive. It doesn’t make sense that Tom has turned against the Children of Liberty considering how committed he seemed last week. It is possible that how thinking ha been realigned to not approving of them or their methods but still resenting aliens though if that is the case then the episode fails to cover that. I did like James’ justification for why he could bring himself to destroy Shelley Island. He wouldn’t trade a life for a monument but he also has faith that he is being true to himself even if the public won’t see it that way. Shelley Island becomes something of a monument to his own integrity and what that represents. It can be destroyed but it can also be rebuilt which in itself represents strength against adversity so as far as he’s concerned the Children of Liberty can’t take anything away from him. He does feel differently later in the episode when talking to Kara about the mistake he almost made which undermines the power of his stance somewhat but the scene itself was very strong. Connected to this plot was Manchester Black’s continued desire for vengeance. He is quickly heading down the path towards villainy in service of avenging Fiona’s death and is at the point where he is willing to betray Supergirl in order to get an audience with Agent Liberty. The episode that introduced him did enough work to establish how peaceful he was at that point to make this a jarring shift away from that but his actions still come across as more than a little extreme. In principle there’s nothing wrong with a character driven down a path of vengeance after a profound loss but it’s hard to invest in this because very little time was spent establishing how important Fiona was to him. It’s common in origin stories to have a character killed off to motivate another but in this case there was no attempt to build their relationship so there are significant gaps in his development. David Ajala’s performance is still great to watch though. I like how disarming he is even after being confronted by Kara. He is able to say the things she wants to hear, take advantage of her desire to see the best in others and easily lure her into a trap so that he can achieve his goal of confronting Agent Liberty. 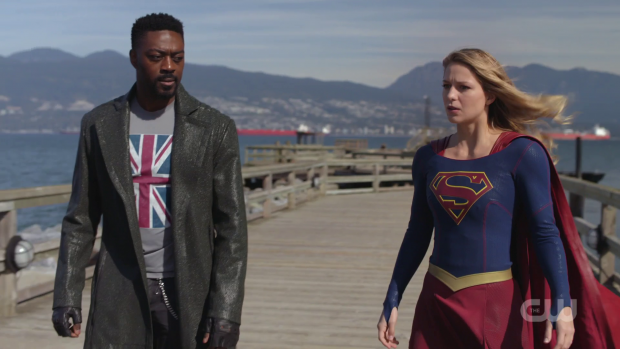 Manchester Black is clearly very ruthless and it’s interesting to consider that he wants the same things as Team Supergirl but isn’t as bound by a moral code as they are. This is further shown when he attacks J’Onn with the empathy amplifier so that he is overwhelmed by the painful emotions of those around him which results in a really powerful scene where J’Onn breaks down in front of Kara because of the weight of those emotions. I’m unsure whether Manchester Black will be redeemed in some way but I am enjoying the unpredictability even if his motivations could be better developed. The most bizarre thing about Manchester Black is the hardline stance the show takes on his actions. Kara and J’Onn are anti-killing which is fine for their values but there’s very little nuance in exploring oppositional viewpoints. It’s very black and white where Manchester is concerned as what he’s doing is apparently fundamentally wrong. I’m not advocating killing but it’s hard to disagree with the fact that his methods have garnered more results than what anyone else is doing. If he was on Arrow or Black Lightning then arguably those results would be celebrated and his actions considered necessary but here he’s a dangerous threat and has to be stopped. It’s understandable that the show has a set of values that it looks to promote every week with Kara as the face and voice of those values but they should be open to challenge and not having easy ethical answers to every problem should certainly be addressed otherwise they are nothing more than a collection of empty ideals. Why not have Kara challenged on her views on killing and asked the difficult questions around the forward momentum Manchester has clearly achieved through his questionable methods. Instead he’s labelled as a “bad guy” and the writers call it a day which flies in the face of the good work done creating a more complex framework this season. This episode has a big Kara problem in general in that she does almost nothing. Her powers are expensive to visualise which is probably why finds herself depowered so often. It’s a lazy way to manufacture danger when there are definitely other ways to create this. A good example was last week where she couldn’t possibly save every marked alien because of the sheer number of Children of Liberty. As I mentioned above there isn’t enough effort put into challenging Kara’s values and how they apply in the real world. Strangely enough, the animated film Superman Vs. The Elite does a great job of holding a mirror up to Superman and forcing him to justify what he stands for amidst a sliding scale of morality. The trouble with ignoring the opposition and failing to have the debate is that Kara along with the other characters come across as naive at best and stupid at worst because they can’t involve themselves in the more difficult discussions. Instead of doing this, the writers default to a depowered Kara about to be killed and make this the climax of the episode. It’s a reminder of the more problematic days of Smallville where Clark felt like a supporting character in his own show. Lena has progressed her experiments with the Harun-El to Human trials and spends the bulk of her screen time talking to the first volunteer (Michael Johnston). At first she refuses to learn his name because she thinks it’ll be easier to put him at risk of death if she sees him as a number. Eventually she learns that his name is Adam and finds it even harder to think of him as a variable in her experiment. Adam basically takes on the function that a hallucination would normally fill. He gives voice to all of her fears and forces her to really think about the decisions she has made leading up to this point. Lena tries to reassure herself that there’s nothing wrong with what she’s doing as she has taken the necessary steps to ensure that her experiments are as free of risk as possible. Adam has no desire to be a hero, suffers from a massive inferiority complex after the death of his more talented and -to his mind- worthwhile brother and has a desire to do something important with his life. Lena chose him because she felt he would be responsible if given super powers; she decided this largely because of his answer to the multiple choice question around what to do with a spider trapped in the bath. Her mindset is that leaving it alone is the best way because doing anything else makes an assumption not really based on anything. It’s a really bizarre metaphor that is told with enough conviction to appear more clever than it is but has no real meaning. The problem with these scenes is that Adam isn’t a character that can be invested in because he’s nothing more than a sounding board for Lena before he’s killed to prove how dangerous her experiments are and that success will come at great cost. The writers try to characterise Adam to some degree but since we don’t know him, his brother or anything about his life up to this point outside of what he talks about here. 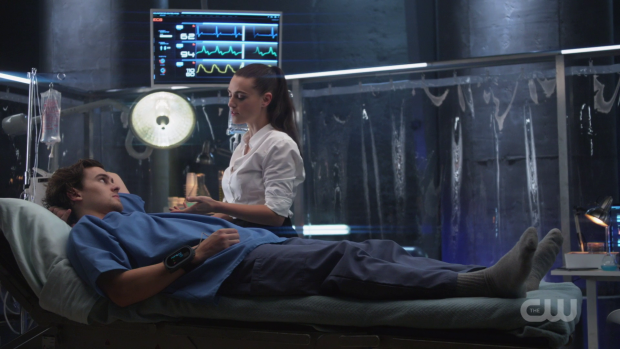 His plea for Lena to test him doesn’t come across as the altruistic sacrifice that the writers clearly intended so the whole exchange feels very tonally inconsistent even with Katie McGrath’s excellent performance. An underwhelming episode that fails to address the underlying complexity of the situations being presented. James coming face to face with Agent Liberty who announces his intention to use James as the embodiment of his cause who will claim responsibility for the destruction of a monument to aliens being welcome. He goes along with this to help Tom who will be killed if he doesn’t cooperate and justifies this by having faith that his reputation can’t be taken away from him because he knows what sort of man he is. Anything torn down can be rebuilt as far as James is concerned though he doubts that by the end of the episode. It’s a really bizarre plot that doesn’t fit Ben Lockwood’s usual panache nor does it really make sense as he could surely stage this destruction without Guardian serving as his poster boy and accomplish the same thing. The James/Agent Liberty interaction doesn’t work because of the disconnect created by the presence of the mask as well as the uninteresting rhetoric being spouted by Agent Liberty that feels less like a well founded belief system and more like a shallow mission statement. Manchester Black’s revenge fuelled crusade is really well acted though his motivations don’t make an awful lot of sense when analysed to any major degree. It’s entirely at odds with how he was introduced though discounting that it’s hard to argue with the fact that he gets result even if his current values are at odds with Kara’s. The writers want to paint him as the “bad guy” because it’s the easiest label to apply but no attempt is made to have the difficult debate and really challenge Supergirl’s ethics. There is a strong debate to be had here but the writers shy away from it because Kara has to be right even if it isn’t justified. Kara is also once again depowered to manufacture tension which doesn’t work and makes her a bystander in her own show when she should represent one side of an important issue. This is disappointing considering all the work done to ground this season in complexity. Lena’s experiments with the Harun-El moving to Human trials both works and doesn’t. Adam isn’t at all worth investing in because there isn’t enough time to know much about him but Katie McGrath’s performance as well as the details about Lena’s past offering some background for her self loathing. The fact that Lena is directly involved in the experiment offers further proof that she isn’t as bad a person as she thinks she is.